Rossington's player manager Lee Holmes tries his luck on goal during the 2-2 draw with AFC Emley. 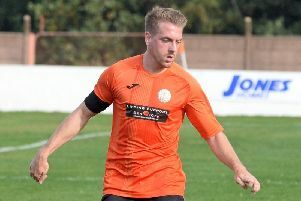 Armthorpe Welfare got off the mark in the Premier Division with a deserved 3-1 win at newly-promoted Pontefract Collieries. And Rossington Main would have also started with maximum points in Division One had it not been for a stoppage time equaliser that meant they had to settle for a 2-2 draw against AFC Emley at Oxford Street. Armthorpe could not have wished for a better start, going 1-0 up inside the first minute. Craig Aspinall clipped a lovely ball over the defence for Joe Lumsden to run onto and score with a neat finish across the keeper. Pontefract had a couple of chances to draw level before the break but Welfare continued to look dangerous going forward. Seven minutes into the second half and Armthorpe had some breathing space. Lumsden was again the scorer, hooking the ball home after Gary Mundy had headed back across goal from Kieran Benson’s deep cross. It looked as if Armthorpe would be in for a nervous finish as Pontefract pulled one back when Mark Whitehouse clipped a free kick over the wall and into the bottom corner on 72 minutes. However, Brian Johnston’s side wrapped up the points with the third nine minutes from time. Lumsden was this time the provider, winning possession before playing the ball inside for 18-year-old substitute James Handley to neatly slip it past the keeper. It looked like Lee Holmes’ reign as player/manager at Rossington would get off to a winning start following the departure of Steve Brennan over the summer. Holmes started where he left off last season by giving Rossington a 20th minute lead. The joy was short lived as just three minutes later Emley’s own prolific scorer Ashley Flynn restored parity. Holmes hit his and Main’s second midway through the second half to put the hosts back in front. However, Flynn pounced for his second in time added on to tie the scores at 2-2.